An insidious pest is making fruit drop early, the skin damaged and the flesh brown. HOME GARDENERS from Northland to the Waikato are complaining that their much anticipated feijoa crop is dropping earlier than expected, the skin is damaged and the flesh inside is brown or discoloured. The likely culprit is the guava moth (Coscinoptycha improbana), an alien invader that was first spotted in Northland in 1997 and now established as far south as the Waikato, which targets feijoas as well as guavas (and indeed has a taste for citrus, loquats, peaches, plums and macadamia nuts too). It's an insidious pest that causes similar damage to apple codling moth larvae. The female moth lays its eggs on developing fruit and, when they hatch, the larvae burrows into the fruit, where it lives out its stage of the life cycle, safe from predators and with plenty to eat. Eventually, it eats its way out of the ruined fruit, leaving trails of brown frass in its wake. The main problem with the guava moth, Kleinpaste says, is that it has no defined season (unlike the codling moth) — and targets such a wide range of common home crops. The moth is small, black and white, speckled and about one centimetre long. It is difficult to distinguish from other New Zealand moths of the same family. The larvae are pink and up to 8mm long and feed in the ripening fruit (in loquats, peaches and macadamia nuts, it bores into the kernel/nut too). When the fruit falls to the ground the fully-grown larva leaves the fruit to pupate in leaf litter and soil debris. It constructs a camouflaged cocoon out of loose bits of stick and leaves about 8 mm long. The adult moth emerges about 14 days later. 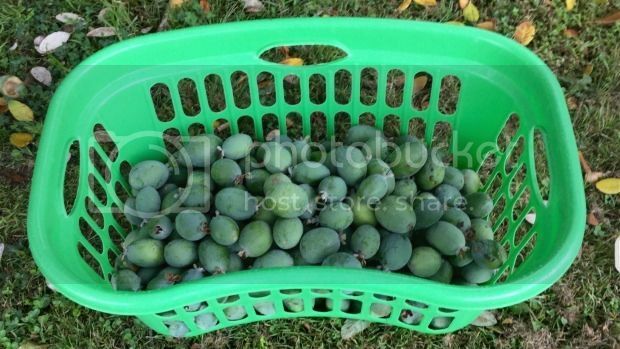 Famously easy-care and prolific, home feijoas face a new threat. Guava moth infests fruit all year round. Its hosts include yellow guava and feijoa in autumn, citrus (lemon, mandarin, orange, grapefruit) throughout winter/spring, loquats in spring, plums and peaches, nashi pear in summer, and macadamia nuts from summer through early winter. “The problem is the only stage of its life-cycle when the guava moth is vulnerable is when it is very young,” Kleinpaste says. There are currently no insecticides registered for use against guava moth, and the number of potential hosts means it's difficult to recommend a single product for control. Kleinpaste suggests using a caterpillar-specific product such as Yates' Success, which contains the active ingredient spinosad, derived from beneficial soil bacteria, every fortnight from when the fruit on your potential host is half-ripe. Or you can hang a pheromone monitoring traps for moths (available from horticultural supplies stores and garden centres) in your tree. These triangular shaped plastic traps attract male moths that get stuck in the sticky bases of the trap. When you start to catch moths, it's time to start a preventative spray reigme. If you don't want to spray, the only option currently available is to grow your crops under fine netting. However, it's also a good idea to remove fallen and rotting fruit and associated leaf litter from beneath trees and bury or burn it. This will destroy pupating guava moths. 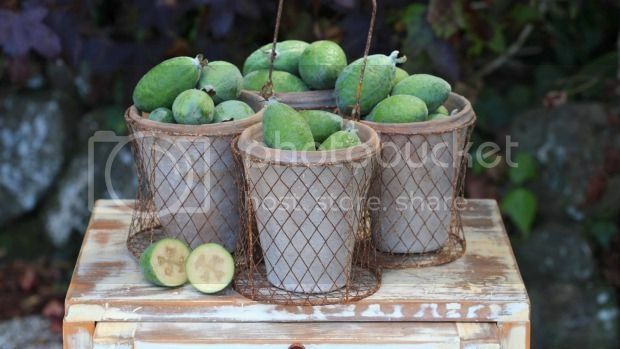 Talking about feijoas....my four trees stopped producing fruit a couple of years ago. Somebody told me that the way to fix that problem is to ruthlessly prune the trees and they would start producing again. So about four months ago, my neighbour and I got stuck into the trees on my place and also into his own feijoa trees, which weren't very good producers. We were pretty ruthless and cut everything back almost to the trunks. I haven't taken much notice of my own trees since we butchered them, but half-an-hour ago, I headed down the back of the section to chuck out a whole lot of stale bread for the birds and noticed that not only has a huge amount of new growth occured on the four feijoa trees, but also that they have gone absolutely ballistic producing fruit and the ground beneath the trees is now covered in fallen feijoas, with plenty more still on the trees yet to drop. So it looks like the trick of ruthlessly pruning feijoa trees when they stop producing actually works really well.